When brands think about search marketing, they often think in terms of potential customers searching for information in categories related to the product their brand is selling. Bidding against searches on their own brand terms may seem like less of a priority, particularly if a brand is well-served by organic search results (think CocaCola hypothetically bidding on searches for “refreshing drink” but neglecting to bid on searches against their universally-recognized name). Whether you have the luxury of name recognition, or you’re duking it out as a challenger brand, there are solid reasons to invest in brand terms. Here’s five to consider. Whenever possible, you want to dominate the search results, and to do that, two results are better than one, with paid ads and organic results working together to own the the real estate at the top of the page, particularly if you’re in a competitive space. Additionally, utilizing the full offering of ad extensions will maximize the size of your ad, and those extensions will only show if your ad appears in one of the top three spots on the page. Bidding on brand terms will go a long way towards securing those extension-qualifying spots. Bidding on your brand terms helps you control your message. Organic listings might be free, but the linked content they show can sometimes be pretty boring and isn’t always linking to the best conversion points on your website. 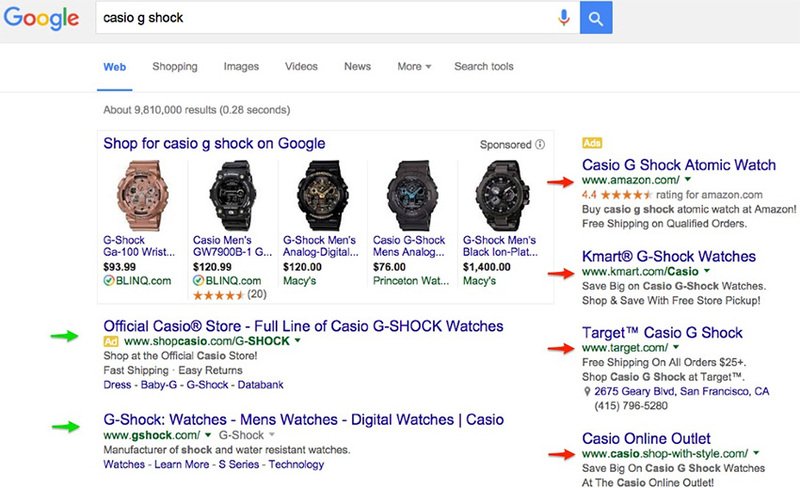 Use paid search to put the messaging that best represents your brand in front of consumers. You can also use the flexibility of paid search to take advantage of seasonal and promotional messaging opportunities. You know what they say, defense wins championships! Your brand is important to you, and you want to control the way your customers and potential customers see it. You don’t want a competitor nested above your organic result with a catchier message and a more enticing promotion. Or worse… negative messaging. Advertising against your brand terms, you’ll have the advantage from a Quality Score perspective, so the lower CPC’s should help you play good defense and own the top spot on brand searches. Neglecting to bid on your brand terms can represent a false economy, especially when brand terms are really inexpensive, have high CTR and high conversion rates. Additionally, Quality Scores from these terms may help provide a halo effect across other campaigns in your account (more on running brand and non brand in the same account in another post). When people are searching for your brand terms, often intent for your product or service is high, with searches coming from customers close to converting at this point. SEM is not the place to be cutting cost corners when there’s the opportunity to harvest intent from your search channel. Bidding on your brand terms creates a better brand experience for customers, protects your brand and gives you greater control and flexibility over your message. And most importantly it capitalizes on the equity you have already paid into your brand. To anyone thinking they can’t afford to bid on their brand, I’d respectfully suggest that you can’t afford not to. If you’re looking to invest in search marketing for your brand, or Interested in having someone evaluate your search marketing strategies, give Kiosk a call.